JBL 361549-001X Compression Driver DJParts - All Variety of Parts that DJ Needs. 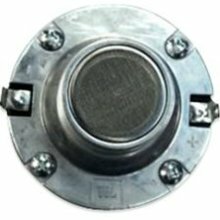 JBL 361549-001X Compression Driver for MRX 2408HThe JBL 2408H HF is an annular polymer diaphragm, neodymium compression driver in 8 ohms. The 2408H HF is a replacement high frequency driver for the JBL MRX series speakers.